Editor Charles H. Smith's Note: Adams, an ecologist and invertebrate zoologist by trade, was very interested in the effects the glacial periods had had on the distribution of life in the United States. Original pagination indicated within double brackets. Citation: Journal of Geography 1 (1902): 303-310, 352-357. I. THE DISPERSAL AND MIGRATIONS OF LIFE. Human history shows very plainly that in the bygone ages different races and tribes of men have been very restless and prone to wander about. One race after another has pushed onward, far from its ancient home, and waged war upon other tribes, to conquer or be conquered. On account of this jostling about of human races the social complexion of a region or nation may be very involved. The population, on account of the successive invasions of different races, and their consequent mixing, may be composed of elements, very diverse with regard to the direction of their geographic origin, as is seen in our large cities. Thus the [[p. 304]] population of a region may be considered as a mosaic or mixture (depending upon its degree of organization) of very different elements. Now some one may inquire, what has all this to do with geographical origin and migrations of the plants and animals of the northeastern United States? The fact is, the relation is more real than is apparent at first glance, because very nearly the same principles are involved in the distribution and geographic origin of man that are involved in the case of the other animals and the plants. We are most familiar with these fluctuations in the case of human affairs, but this moving about is none the less true for all the rest of the living world. The struggle for new territory is not perhaps as apparent as in the case of man, nor does it attract so much direct attention, but it is none the less real and all-pervading. It is not only true that the human population of a region may be, and usually is, of diverse origin; but the same law holds with equal validity in the plant and animal population of any given region. The apparent abruptness of the transition with regard to their method and means of dispersal, from man to the lower animals, is bridged over somewhat if we consider as an intermediate class the domestic plants and animals, the weeds and vermin, which follow man in all his travels. In considering the spreading or dispersal of life we may take two distinct points of view: either the "convergent" or the "divergent." We have already called attention to the "divergent" view, or the dispersal of life from its ancient home; and from this standpoint the causes and means of dispersal are emphasized. From what may be called the "convergent" standpoint, life is considered as it converges toward, or comes into, a region from various directions; and in such cases attention is turned especially to the direction of geographical origin and the highways by which the life has come into the region. In the present paper we wish to consider the forms of life found in the northeastern United States, north of the Ohio River and east of the Great Plains, in order to obtain some idea, if possible, as to their geographic origin and migrations. For this reason we must consider the subject from both points of view; but before we discuss the main point in detail it will be well to examine a few of the most conspicuous causes and means of dispersal of plants and animals which have been factors in the present problem. For animals especially, overcrowding should be mentioned. As a rule, more young are produced in a given region than are able to mature. This necessarily leads to a struggle; and here, as elsewhere, [[p. 305]] the sharpest competition is between those organisms which have the same needs and desires; and hence the strife is between those forms which are most alike or closely related. To be sure, overcrowding leads to migration of those kinds of organisms only which are able to move about. In the case of plants which are rooted to the soil and hence cannot migrate, there are other means of dispersal which make it possible for seeds to reach unoccupied territory. These means of dispersal (by winds, animals, etc. ), work rapidly, and their influence is best known because it becomes apparent in a very short time. On the other hand there are some factors which work very slowly, and yet in the course of time are able to bring about almost unlimited changes. Reference is here made to changes in the climate or topography of a region. In considering any cause of dispersal, such as overcrowding, climatic or topographic changes, we must bear in mind that the habitat, and the necessary physical conditions of life, must lead. In overcrowding, the fundamental idea is that the only available habitat lies at the unoccupied margin. Thus seeds may fall on both the crowded and the unoccupied territory, but it is primarily only those which fall on the unoccupied territory which survive; and thus when the habitat is expanding in a definite direction, the plant is led into new territory. The change of climate at a given place is a very important cause of dispersal. Aside from seasonal changes, this factor works slowly, and may be complicated by physiographic changes. At present we do not wish to consider seasonal changes. In trying to understand the geographic origin of the life of northeastern North America, much attention must be given to a great change in climate which brought about an absolute and complete change of the life of this region. This great change doubtless produced a more marked contrast in the life of this region than now exists between that of the Gulf States and that of Labrador. Perhaps a greater change in climate has never taken place during the history of life upon our planet. The North American icesheet at time of maximum development. Reproduced by permission of Prof. R. D. Salisbury. mainly arctic life to survive near its margin. The extreme southern limit was not uniformly maintained, for there was a considerable [[p. 307]] fluctuation at different times, though the last extension was not the maximum one. Twice, at least, the ice retreated far to the north, but only to return again, as is shown by the presence of southern plant and animal remains in the Interglacial beds of Toronto. The maximum southern limit of this sheet is shown in the accompanying plate. A knowledge of these fluctuations is not necessary to an understanding of the Postglacial migrations. Finally the ice retreated far to the north and permitted life from the south to move into the newly opened territory. We are thus enabled to see that, save some boreal forms, the whole animal and plant population of the northeastern United States is of Postglacial origin. But what has become of the life in the region before the ice advanced? This is a very important question and one to which students have given but little attention. Some seem inclined to think that most of the temperate life was driven very far beyond the edge of the ice sheet, even to the Gulf Coast. Yet there is evidence which apparently does not favor this extreme view, and seems to indicate that south of the Ohio during the ice age there was a diversified temperate flora and fauna. It is one of the fundamental laws of the distribution of life that closely related forms originally occupy continuously the area over which they are dispersed. That is, they are not isolated from one another by any considerable space, but occupy continuously a certain region. When an animal, for example, is found at some considerable distance from others of the same kind and absent from the intervening region, its distribution is said to be discontinuous. Under such conditions, unless the animal has exceptional means of dispersal, it is believed that formerly this intermediate unoccupied region was inhabited by this particular animal; or, in other words, discontinuous forms were once continuous in their distribution. There is still another very important element in the flora and fauna which must be considered, and that is those forms found in the southeast and whose nearest relatives occur in Japan and eastern Asia, but not in the intervening region. These are the relicts or remnants of a preglacial flora and fauna, which were formerly connected at the north and were driven asunder by the onward march of the ice. These relicts include not only a large number of our characteristic deciduous trees and herbaceous plants, but also a variety of animals, for example, certain fish and river mussels. There is still another alternative, and that is the two forms have arisen independently. This does not seem altogether improbable in [[p. 308]] some particular cases; but that a large number of genera and species should do so at the same time and place does seem improbable. The occurrence of a large number of plants and animals in the southeastern United States which do not occur elsewhere excepting in limited number and variety, indicates that perhaps this region was one of origin, as well as of preservation of life during the Ice Age. From the foregoing we see that while the northeastern United States lay deeply buried under a mantle of ice, in the southeastern states beyond the glacier's frigid influence, deciduous forests flourished; while in the streams there were mussels and crayfish which had eastern Asiatic affinities. There were still other forms which seem to have originated in the southeast and to have reached their greatest development in that region, only a few having spread from it. First. The evident spreading or migrations noticed in the case of man are equally characteristic in all other forms of life. Second. The present life of any region is a mosaic composed of elements from all possible directions. Third. There are numerous means of dispersal: free forms migrate; stationary forms have special means. The habitat, or climate itself changing, causes forms to spread into new territory, as was the case in the Ice Age. Fourth. The original plant and animal population of the northeastern United States was cleared away by the advance of the glacial ice, many forms taking refuge in the southeastern States. Fifth. The present life of the northeastern United States is of postglacial origin primarily. This now leads us to our main point, since we have now briefly considered the antecedents which are necessary as a background to an understanding of the geographic origin and migrations of the life of the northeastern United States. The present must be interpreted in terms of the past. II. POSTGLACIAL ORIGIN AND MIGRATIONS OF LIFE. With the final retreat of the ice to the far north, and the return of a mild climate to the glaciated region, temperate forms of life again pushed back into the open territory. The glacial retreat was doubtless gradual and left behind it no unoccupied territory, because the temperate forms pushed close upon the rear of the arctic ones, which fringed as a zone the edge of the ice. Under such circumstances there are many advantages to those favorably located, and accordingly the first wave of life which became dispersed over the [[p. 309]] glaciated region was the distinctly glacial fauna and flora which skirted the border of the ice-sheet. The present living analogue of this first wave is the barren ground, lichen and moss, types of the far north. Hardly a trace now remains in the eastern United States of this pioneer class, and this class is now restricted to very limited areas or mountain top "islands" as in the White mountains. The present distribution of these arctic-alpine "islands" brings up a number of very interesting points. How is it that these alpine plants and animals are now found so far south and only upon high mountain peaks? This question could not be rationally explained until the influence of the Ice Age upon life became recognized, and would indeed be a difficult one to answer if we did not take into consideration past conditions of climate and topography. We must recall that the arctic conditions which now occur, outside of the arctic regions, only on high mountain tops, at that time extended to the very base of the mountains; and as the ice retreated to the north, this cold zone gradually moved up the sides of the mountains, carrying with it a characteristic flora and fauna. Thus with the retreat of the ice the first wave of life had two evident possibilities before it: first, to follow the ice north, or to follow the cold zone up the mountains. By this means small colonies of arctic plants and animals became separated from the main body of forms, and thus became alpine. To be sure this segregation could occur only where the mountain peaks are isolated. If the mountains had been of sufficient height and had extended far to the north, a highway would have been retained to the original stock and thus the distribution would not have become discontinuous. From the above interpretation it seems fair to conclude that the arctic forms which now occur at alpine heights are relicts of the former widespread glacial fauna and flora, whose distribution has become discontinuous by a change of climate. The next general class of plants and animals which followed close upon this arctic element is that which makes up the second wave. This corresponds approximately to the present subarctic life in the north and the subalpine on mountains, below the tree line. It should be clearly understood that these classes or waves are only intended to apply in a general way and are not sharply defined. The best idea of this second wave may be gained by considering the life of the coniferous zone of Canada. Along its northern limit the trees are stunted willows, birches, and alders; and farther south spruce, larch, hemlock, and pines, are the representative trees. This is the zone of fur-bearing animals. In swampy places a dense growth of [[p. 310]] sphagnum mosses covers the surface like a thick soft mat. This same type of coniferous forests is well developed in the northern Appalachian mountains. In this particular case on account of the direction and height of the mountains, the distribution of this type of life is much more continuous than in the case of the arctic-alpine forms; and, unlike the first forms, we have small relict "islands" of second wave types in swamps or on sand dunes. The swamps have been called "boreal islands," on account of their discontinuity and their being composed of northern forms which are surrounded by more southern types of plants and animals. There is a fairly distinct zone in the glaciated region in which these "islands" mainly occur, although they are not confined to the glaciated country exclusively. The topographic effect of glaciation very often favors the formation of lakes which, as they fill up, become ponds and marshes; and it is in this zone that these "boreal islands" occur most abundantly at present. The two waves of life which we have just been considering are types very distinctly adapted to a cold or cool climate, such as is found either in high latitudes or high altitudes. The third wave was of a more temperate type and followed farther in the rear of the ice. This wave is represented by the dominant types of life to-day found occupying Illinois, Indiana, and Ohio. It was a wave of deciduous shrubs and trees, oaks, hickories, elms, locusts, haws, and a host of others, and of abundant animal life, insects, molluscs, amphibians, birds, and forest-inhabiting mammals. 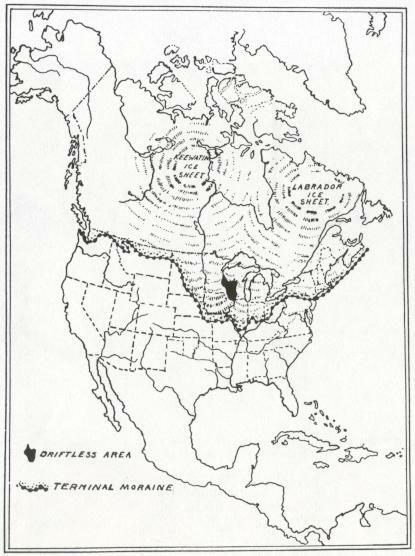 A comparison of the three waves brings out some interesting relations and contrasts, similar to those which one might observe in travelling south from the barren grounds of Canada through the stunted tree growth near the tree limit, on through the belt of dark, coniferous forests into the deciduous forest belt of Illinois. The types of plant and animal life thus observed would be fairly representative of the forms which have passed successively over parts of the northern United States since the Glacial Period. These waves [[p. 353]] of dispersal were widespread, but perhaps only the first was of universal occurrence over the region under consideration. Only the first wave reached the high alpine summits of the White Mountains, while the first and second reached the Appalachian mountains, the lowlands alone being reached by all three. The first wave must have been composed of but few species, though abundant in individuals, but the second had a greater variety of species; and in the third the proportion of species was greatly increased, while at the same time there was a corresponding decrease in the number of individuals of the same kind. The present distribution elsewhere of the types represented by the three waves is instructive. The types of the first are distinctly of circumpolar distribution; that is, their continuous distribution is in the polar regions. In the case of the second there is also a circumpolar distribution of many of the forms, but there are certain forms limited to restricted areas; while in the case of the third wave we have forms which show still more restricted distribution, and correspondingly a less number of forms of wide distribution. It is in this third wave that we find the characteristic American forms of life. Thus with each successive wave there was an increase in the diversity and number of forms peculiarly American, which pushed into or over the northeast. The first and second waves are thus at present considered characteristically northern, and evidently originated under boreal conditions. The affinities of the third wave clearly point to the south for its postglacial origin, although in this wave there is an important element in both its flora and its fauna which suggests a preglacial northern origin. We may look to the south in two directions for the geographic origin of the third wave. First, to the region directly south, or the southeast, with its genial climate, abundant rainfall, deciduous forests, and abundance and variety of animal life both on land and in the streams; and second, to the west and southwest, with its arid climate and prairie or desert types of life. Each made its contribution to the third wave, but in very different proportions. The southeastern United States had the advantage of proximity and a climate similar to that of the region to be invaded, and shows to a corresponding degree its greater influence upon the life of the northeast. From what has already been said of the history of the northeastern United States it is very evident that the present life of that region is in a sense an overflow from the south. This is most emphatically true of the third wave, which shows plainly its southern affinities. In studies of [[p. 354]] geographic origin it is thought fairly safe to consider the region in which a group of animals or plants reaches a maximum development, as the centre of dispersal. This is certainly a safe criterion in the case under consideration. Several groups of plants and animals occur in abundance in the southeastern states, and with numerous varieties which occur elsewhere only in limited numbers. This can be illustrated by the river mussels. The greatest development of river mussels in the world occurs within a radius of three hundred miles of Chattanooga; and more species occur within this area than in all the remainder of the world. The southeast is therefore well recognized as a centre of distribution of these shells. The river mussels of the Mississippi drainage in the northeast plainly show by their affinities that they have been derived from this region and that they are an overflow from the southeast. When the principles used in determining geographic origin are applied to the study of the life of the northeast, some very interesting relationships at once become apparent, which point clearly and distinctly to the southeast for the origin of several characteristic groups of plants and animals. Only a few of the more prominent and dominant types can be mentioned, and of these the famous rich deciduous forests must first be noted. There is no finer development of deciduous trees in the world than in eastern North America; and botanists clearly recognize that the forests of the northeast are of undoubted southeastern origin. This same origin holds almost equally well for the herbaceous vegetation, excepting the western prairie forms. Among animals, the land snails show the same condition of affairs. They are very abundant in the southeast and have spread to the northeast. This also holds true for both the crayfish and river snails. Among vertebrates the tree-toads, salamanders, and turtles all belong to this same general category in showing a southeastern origin, and it will not be surprising if the same should prove to be true in the case of fishes, birds, and mammals. While the southeast has undoubtedly been the most important centre of dispersal for the third wave types, it has not been the only one. The smaller element from the west and southwest must be given its due, though small, credit. This western influence, as might be anticipated, is most conspicuous in the more prairie sections of Iowa, Minnesota, Wisconsin, and Illinois. These prairies have furnished a favorable home for a number of plants and animals whose relationship and origin assuredly point to the west and [[p. 355]] southwest. The distribution of pocket-gophers and ground-squirrels indicate such an origin. Many typical forms of the Great Plains are evidently of southwestern origin, the Plains having been their outlet or highway from the far southwest. The Plains as a highway of dispersal have previously been noted. It is instructive to determine the geographical origin of the elements into which the life of a region may be reduced upon analysis. Our investigations should not stop at this stage, but should include, if possible, a study of the conditions which determine the presence of these different elements and the pathway along which they must have travelled in order to reach their present destination. From the Great Plains east there is a prairie highway reaching as far east as northern Indiana, and forming a sort of peninsula extending east from the Great Plains into a densely forested region. This peninsular highway is composed of parts of northern Iowa and Illinois, and of southern Minnesota and Wisconsin. While the general direction of the prairie peninsula is toward the east, in reality it functions as a southwestern highway, because many of the types of the Great Plains are of distinctly southwestern origin. This is a highway for land forms only, because it does not coincide with any drainage system; in fact, it runs counter to those occurring within its limits. Leading to the north from the southeast, there are two very important highways. First, and most important, is the Mississippi river and valley, and tributaries. This great avenue of dispersal has furnished abundant opportunities for the dissemination of a great variety of forms. Fertile valleys are especially favorable for the northward extension of southern types of plants and animals, in striking contrast to the conditions under which some northern forms flourish in southern regions, as in the case of the "boreal islands." These islands, whether they are on alpine mountain peaks, stagnant swamps, or arid sand-dunes, all stand for severe conditions; and it is very remarkable that there is so much similarity in types found under extreme conditions of whatever kind, a similarity which has given rise to a vast amount of confusion in the study of the causes of distribution. But fertile valleys favor northward dispersal of certain types only, while others attain a more northward distribution in arid, sterile regions, as in the case of the Great Plains. That the Mississippi river and tributary streams and valleys have been a great avenue for aquatic and amphibious life is so evident as to be hardly worthy of mention. The second important outlet is from the [[p. 356]] southeast, and this has been along the Coastal Plain. This pine barren Coastal Belt has favored, as did the Great Plains, a northward extension of a southern association of types. From the preceding facts and relations, which have been hastily reviewed, it should be apparent that in the past history of a region, the conditions and highways must be taken into consideration if we wish to understand the origin and migrations of the diverse elements which enter into the fauna and flora of any given region. The biological landscape of the northeastern United States has passed through wonderful transformations since the glacial ice covered the region. Let us by way of summary briefly picture, as best we can from our knowledge of the conditions, the general succession of life which followed northward the final retreat of the ice. Let us imagine ourselves standing upon some vantage ground (say the forested region of southern Wisconsin), and watching the succession of forms slowly and gradually pass northward close to the base of the retreating ice. A zone of bare ground fringes the edge of the glacier, where the fluctuations of the ice and the glacial torrents subject the soil to frequent disturbances. Farther away on stable ground variegated mosses and lichens flourish in abundance, while in the shallow bog-like depressions, between the knolls of the drift, sedges and rushes grow in great profusion. The same plants fringe the borders of ponds, lakes, and sluggish streams, whose noisy water-birds announce that summer migrants have again returned. Brilliantly colored arctic plants, gentians, saxifrages, and anemones, grow in solid banks and cover protected slopes. In the sheltered valleys and along the banks of the larger streams, stunted willows and birches make shelter for the ptarmigan, while all else is a vast treeless waste. The first wave of life has passed on, and though there is no break or sudden change in the procession, there is a constant and marked transformation continually taking place. By degrees the mosses and lichens no longer give tone to the landscape; grassy meadows and stunted willows, birches, and alders speed further and further from the banks of the streams. Later, trees of larger size, pines, hemlock, spruce, and larch, multiply in number, and the barren aspect of a treeless waste has gradually passed away as these pioneers of the second wave move forward; and with it a dense forest of conifers crowds upon the grassy meadows, and breaks them up into islands surrounded by a sea of evergreens. The landscape now presents a dark and dense forest of evergreens, through whose branches the [[p. 357]] wind soughs and moans, and whose forest floor is carpeted by a dense, damp mat of mosses and pine needles. These mighty forests hold such absolute sway that it seems as though nothing could dislodge them; but the pioneers of the third wave now begin to creep to the north and insinuate themselves, as a wedge, along the fertile valleys. These flat-leaved deciduous trees appear to make but little advance with each advance of the procession, it becomes more evident that the third wave is slowly moving on with its oaks, hickories, ashes, maples, and walnuts, and a host of shrubs and herbaceous plants with their varied animal associates, those types which characterize the northeast to-day. Along the prairie peninsula there comes a small delegation from the Great Plains, and up the Mississippi valley a vast assemblage from the southeast, making up the great bulk of the fauna and flora of northern United States, that show southern affinities.